"Brief headlines designed to entice the ignorant and gullible, when collected and examined as a body of work, chronicle the issues occupying contemporary society, however ridiculous. " This small collection of poetry takes its title from the interminable pestilence of the computer age, not the “delicious meat-like substance of the same name,” as clarified up front by the author. Further, I Am Spam was inspired not by the commercial intent of the messages themselves but their subject lines, respectively—rich fodder for poetry, indeed, in all their misspelled glory. If for no other reason, this book is a triumph of spirit thanks to the author’s ability to harness a social blight for use as a muse. Brief headlines designed to entice the ignorant and gullible, when collected and examined as a body of work, chronicle the issues occupying contemporary society, however ridiculous. Subject lines are whimsically spun into insightful explorations of the Gen X/Gen Y fragile eggshell psyche. Gel Patrick heralds a perennial optimist who faces balding with a battery of hair care products and imagination. It’s Friday! What a Crazy Gang! weaves together the lives and activities of varied characters as they play Scrabble online at the office, discuss wedding plans in a Jetta on the freeway while listening to Creed, balance hostess work at Hooters with the pursuit of a college degree, and quit a job at Kinko’s to play full-time in a band. Dean’s poetry is rich with imagery. “Chapped in winter, blossoming in summer,” City Lips are compared to “overstuffed pillows on a courtesan’s bouncy bed”. A child engrossed in a book is described with “translucent blue eyes skidding from left to right like bald tires hydroplaning on rain-slick streets”. Playful alliteration illustrates primates “gathered in gangs on grassy tundra, rubbing asses against tactile tree bark in reward of relief”—whether the reader wants to envision it or not. Well-metered structure makes for a smooth read. A few selections playfully marry direct mail to theatre of the absurd. Get Your Coupons for All of Your Pet Needs makes imaginative and outrageous offers: “Crew neck t-shirts in a variety of sizes and colors for toucans, owls and emus;” “spiders of all species enjoy complimentary cocktails with two full-price entrees;” “freshwater fish bikinis only at our downtown store.” Modern Miracles Take Years off Your Face taunts FDA-unapproved products with an emollient made from “the blood of kittens stolen from mobile homes at the stroke of midnight, boiled with frankincense and Vitamin E”. 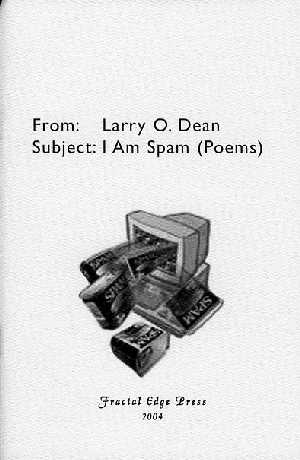 The overall effect of I Am Spam is an indictment on our consumer culture and self involvement, delightfully infused with irreverent humor. The author’s love of words is apparent throughout—think: Bob Dylan meets George Carlin. I Am Spam is a subversive romp for the articulate cynic.